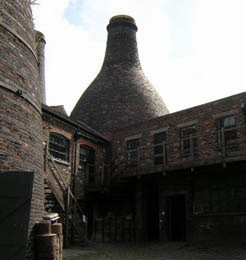 The Gladstone Pottery Museum is a living breathing, fully function Victorian pottery factory. The coal fuelled clay ovens still tower above the potters, and pots are fired as they would have during Stafford's heyday of producing the countries finest bone china. The Gladstone Pottery Museum has not been the site of any documented massacres, or savage injustices if you believe the history books. But there have been significant numbers of paranormal sightings and manifestations here throughout the buildings history. Located in a huge Victorian industrial building the museum has the feel of a labyrinth about it. All the ancient crafts and art of the potters are faithfully recreated by costumed demonstrations. The Pottery was started at this location in 1780 by the Shelley family. The family pottery produced works for several decades but always struggled financially. During the early part of the nineteenth century the Shelley's were forced to sell. John Sheridan bought the pottery and under his tenure it thrived. Potters would come from the local area to use the kilns as tenants of the pottery and many of Stafford's most sought after pieces were produced here during this era. It was the influx of craftsmen that expanded the pottery so quickly that gives the site an exploded, industrial and sprawled look. Staff at the Museum openly admit that they have been taunted by spirits. One staff members recollection bears an uncanny similitude to many previous documented witness accounts. Stood in a room the security guard heard very loud very fast footprints approaching and climbing the stairs. Hearing the commotion and opening the door the footsteps suddenly rung off and the guard was left peering down an empty flight of stairs. There was nothing visible stood on the steps that could have made that sound. Running footsteps and doors being violently flung open is a widely reported phenomenon around the site. These paranormal events have drawn many psychics and ghost hunters inside Gladstone Pottery Museum. Though the Museum looks to promote its family oriented historical education, at night the building really begins to become alive. Another frequently reported phenomena is the vision of an old man stalking the factory. The figure is thought to be the spirit of a potter who was killed at the factory. Arguably the most active room in the Museum is the Colour room. Formerly a storage area for glazes and paints, it seems that those brave enough to rearrange the paint pots have fallen victim to a tantrum from a very particular poltergeist. Objects left in this room have been known to be hurled against the walls. Adjusted paint pots have been met with a barrage of objects; thrown be invisible hands. The Gladstone Pottery Museum is a real step into the past during the day, but at night the past frequently steps forward to meet those brave enough or foolish enough to find themselves there.